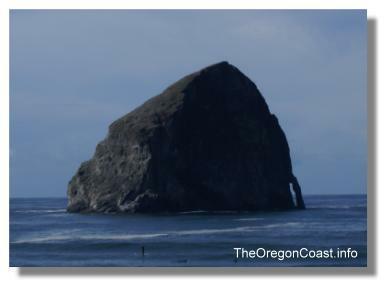 There are two monoliths called Haystack Rock on the Oregon Coast. There are different kinds of monoliths but basically a monolith is a single massive rock or stone. Many monoliths around the world claim to be largest this, or tallest that, depending on where it is, how it leans, what it is made of and so on. Like the monolith in Cannon Beach claims to be the third largest of its kind, and the monolith in Pacific City claims to be the fourth largest of its kind, yet the Pacific City monolith is actually taller than the Cannon Beach monolith. 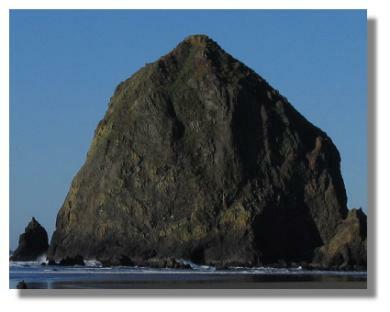 Anyway, they are both great monoliths worth seeing, they are both called Haystack Rock, and they are both on the Beautiful Oregon Coast. Haystack Rock in Cannon Beach is 235 feet tall and is accessible by foot during low tide. Haystack Rock in Cannon beach is claimed to be the third largest monolith that can be reached by land. It is located just north of two smaller rock formations called the Needles. The Haystack Rock in Pacific City is 327 feet tall and is NOT accessible by foot. Haystack Rock in Pacific City is claimed to be world's fourth largest monolith that can NOT be reached by land. The largest monolith in the world is the Ayers Rock in Australia, and the 2nd largest monolith is the Ben Amera in Mauritania.